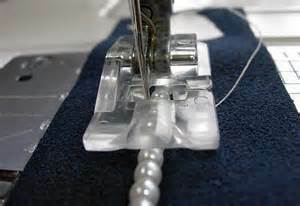 COUCHING is the word that comes from a French word which means to lay down a cord or yarn etc & sew in place. And YES, YES, YES……we do have a JANOME COUCHING FOOT. And yes, I know it is not actually called a couching foot but it works just perfectly for couching narrow & wider cords, yarns, bead strings etc. I wish very much that the BEADING FOOT package used the word couching…..but it unfortunately does not , so listen up: The JANOME BEADING FOOT is one of the feet we use for couching. We will cover other feet which may be used for couching ……..coming up in future posts. The narrow beading foot is called Beading foot L1 and the wider Beading foot is called Beading foot L2. See Part numbers and links to video’s below. 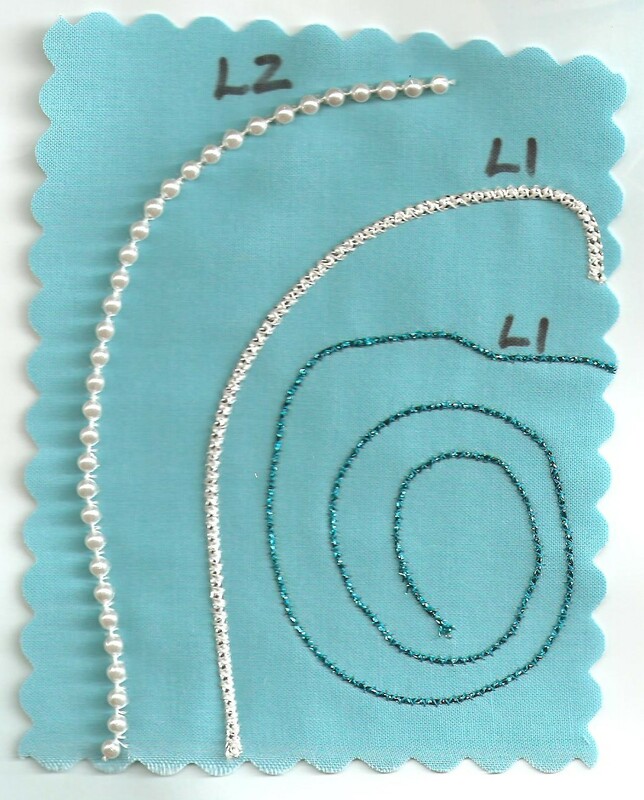 Pic above shows a string of beads , a narrow metallic cord and an even narrower couching thread – all applied to the fabric using a zig-zag stitch and the applicable BEADING foot. PLEASE NOTE THAT THIS FOOT IS NOT JUST FOR STRINGS OF BEADS! It works absolutely perfectly for cords, yarns etc. 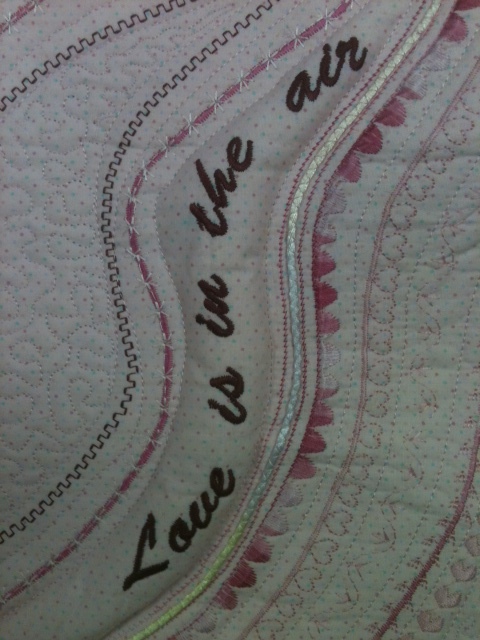 You may use invisible thread if you wish to disguise the stitching you did the couching with. OR you could use a blending colour or contrast colour – depends on what look you want. 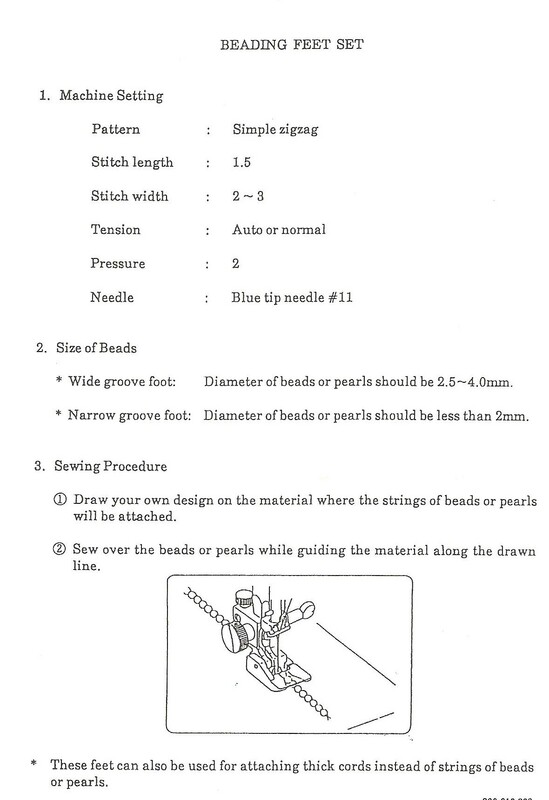 See below for suggested machine stitch and settings. If you have one of the newer JANOME sewing machines which have 9mm wide stitches (the JANOME MC8200, MC8900, MC9900, MC12000, MC15000), then you need Part #202097006 for NARROW BEADING FOOT & Part #202098007 for WIDE BEADING FOOT. CHECK OUT THE VIDEO’S TO SEE HOW THESE FEET WORK for Narrow 9mm Beading foot. And another VIDEO about the BEADING FOOT SET. WHERE THESE VIDEO’S SHOW & SAY BEADS, YOU CAN ALSO THINK CORDS, YARNS,etc. They work exactly the same. This entry was posted in ELNA 7300 SEWING MACHINE, ELNA 760 EXCELLENCE, ELNA 860, ELNA EL730 EXCELLENCE, ELNA EL760, ELNA IN CANADA, ELNA QUILTING MACHINE, ELNA SEWING ACCESSORY ATTACHMENTS, ELNA SEWING ACCESSORY FEET, ELNA SEWING MACHINE, SEWING FUN WITH ELNA and tagged COUCHING FOOT, COUCHING WITH ELNA FEET. Bookmark the permalink.